This Post has already been read 1104 times. 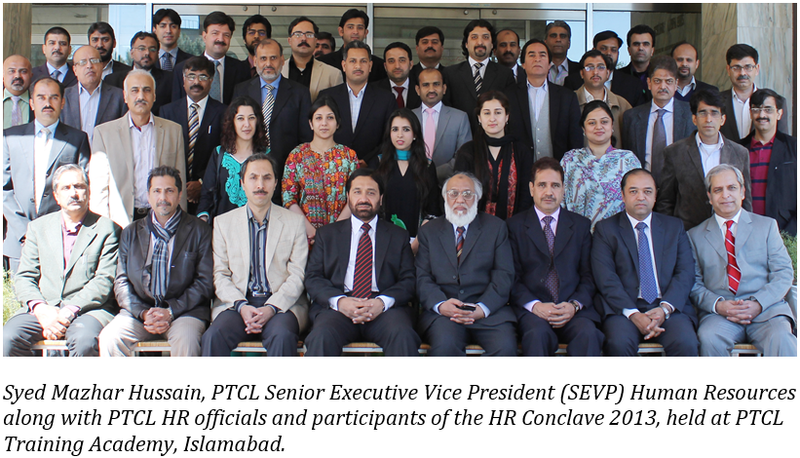 Pakistan Telecommunication Company Limited (PTCL) has organized a one-day HR Conference entitled HR Conclave 2013. The Talent Management & Learning function of HR at PTCL, in lieu of the strategic transformation of HR, joined hands to “Unleash HR Potential”. The conference served as a shared platform for representatives of the HR Community at PTCL to recap the achievements of the past year while projecting towards the future of HR. The conference was led by Syed Mazhar Hussain, PTCL Senior Executive Vice President (SEVP) HR, accompanied by Muhammad Nehmatullah, PTCL Senior Executive Vice President (SEVP) Finance; Jamal Hussain Al Suwaidi, PTCL Senior Executive Vice President (SEVP) Procurement & Supply Chain Management; Mateen Malik, PTCL Executive Vice President (EVP) Operations and Maintenance; Abdul Sattar Naeem, PTCL Executive Vice President (EVP) HR Services; Shahzad Safdar Khan Executive Vice President (EVP) Talent Management & Learning and Naushad H Javaid, PTCL Executive Vice President (EVP), Leadership and Organizational Development. During the course of the conference, HR officials representing the headquarter and regional offices of PTCL identified areas of focus for the year 2013 to strategically align the goals and objectives of the HR Department with the organization’s vision and mission. Interactive team based activities were conducted to instill values of motivation and teamwork. After the conference, Syed Mazhar Hussain also inaugurated the newly built cafeteria at PTCL academy. A corporate dinner and musical evening was also held to commemorate the successful implementation and management of the HR Conclave 2013.